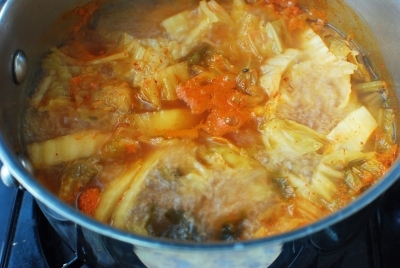 My daughter called the other day to ask me how to make kimchi kognamul guk (김치 콩나물국). She knows nothing beats it on a cold and dreary winter day in New York City. 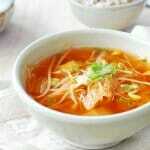 Her phone call reminded me that I had not posted this popular soup recipe yet. It’s definitely a family favorite! 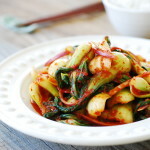 Kimchi kognamul guk is a variation of kongnamul guk which is made with kongnamul (soybean sprouts), a staple Korean vegetable. 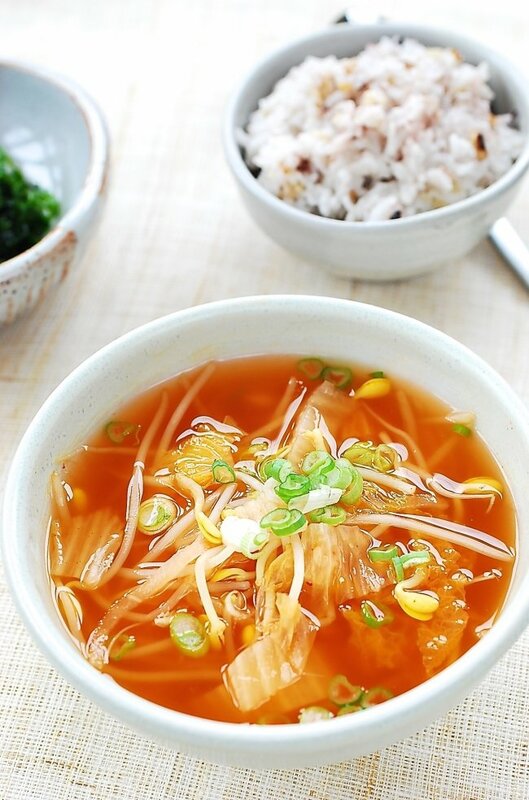 Kongnamul is high in B vitamins, vitamin C and protein. 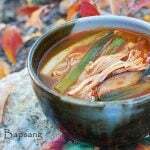 This explains why kongnamul guk is a popular home remedy for common colds and hangovers in Korea. 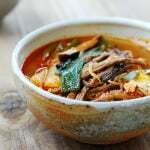 The addition of kimchi takes the soup to another level with a spicy kick that’s good enough to clear your sinuses. When my kids were growing up, I made this soup for them when they had a cold, just like my mother did when I was growing up. 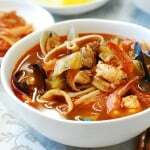 It’s best with an anchovy stock base, but you can use beef broth or simply water. 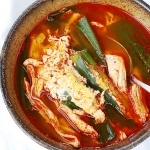 You should use fully fermented kimchi for this soup. 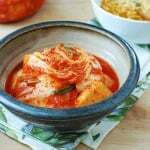 The older the kimchi is, the better. Serve it separately, or over the rice to make guk bap (국밥), a soup with rice in it. I know this is old news if you follow me on Facebook, Twitter, and Google+. For those who don’t, I have some awesome news to share with you. 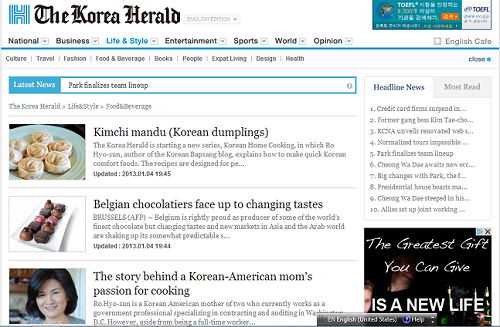 I am now a weekly contributor to The Korea Herald (the largest and oldest English newspaper in Korea). 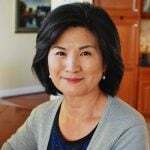 The Korea Herald just published about me (The story behind a Korean-American mom’s passion for cooking) and my first recipe (Kimchi mandu – Korean dumplings)! My recipes will be published on a weekly basis on their website (Fridays) and in print (Saturdays). Please check it out! 6 cups of anchovy stock I or II. See the recipe. 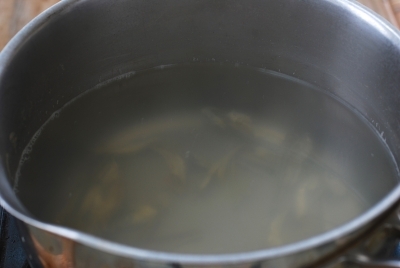 Make anchovy stock with 8 cups of water. See the recipe. Rinse the soybean sprouts a couple of times, discarding any skins that are floating. Slice the kimchi into about 1/2-inch thick strips. Add the sliced kimchi, kimchi juice, gochugaru, and the soup soy sauce (or salted shrimp) to the anchovy stock. Bring it to a boil. Cook over medium high heat until the kimchi turns translucent, about 5 minutes. Add the bean sprouts and garlic. Cook, covered, for 3 - 4 minutes. Do not open the lid while the bean sprouts are being cooked, or the raw bean smell will linger even after cooked. Once the bean sprouts are cooked, taste for salt and pepper. Add the scallions and boil for another minute. Serve separately with a bowl of rice, or serve it over the rice in a bowl. Awwwww I wish this was posted a few days ago when i was still sick hehe. Maybe I could’ve gotten better sooner! hehe. Thanks again for the lovely antidotes and recipe and congratulations again on being a contributer for the Korean Herald! This looks delicious! 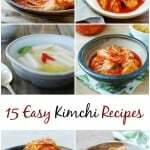 I have a bunch of kimchi that I don’t know what to do with. This is perfect, thanks! It’s warming me up just looking at your awesome photos! The soup looks perfect for tonight’s dinner. We both eat very hot food so my husband would love it too. Why haven’t I bough soybean sprouts? 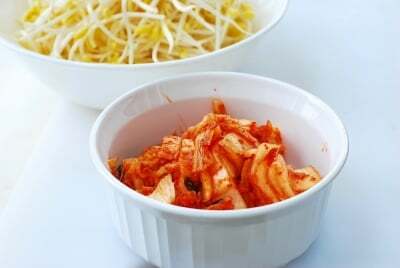 (I do have kimchi though…) I think I will prepare it some time soon because it looks simple, healthy, light but warming and nourishing. Perfect after holiday’s overeating. Congratulations for the publication and future publications too! You will soon be a huge star in Korea. Thank you, Julie! And welcome to Korean Bapsang! I love this soup! So refreshing and one of my favorites. I was wondering if you had any ideas on what I can cook or bake for my Korean mother-in-law. I usually bake her cakes, breads, muffins, etc. as well as home made mandoo/potstickers, but I would love some new ideas. Thanks! My in-laws love my galbijjim (braised beef short ribs). Also, how about Korean sweets like sesame crunch or hotteok? Haemul Pajeon (seafood scallion pancakes)? Hobak Juk (pumpkin porridge)? See my recipe index for more options and let me know if you have any questions. Cheers! This looks great! What do you use in your multigrain rice in the photo? I know you are using some black rice, but what else / ratios do you use? I usually use 7 – 9 grain mix, presoaked. But, didn’t have any that was presoaked when I took this photo. So, just used regular short grain rice (2), brown rice (1), and black rice (1/4). Thanks for coming by! I’m interested in trying grain mixes, but the bags I see at the Korean markets don’t have any soaking/cooking instructions in English. What method do you use? I love this soup!!! I need to make it again while I still have some kimchi left. I hope your daughter is better by now, and congrats on the Big feature! Wow congratulations on getting published in the Korean Herald! Love your blog! Can’t wait to try this recipe. Just wondering if there’s a possible substitute for the anchovy stock? Or will the taste be different if it is substituted? Just use water. It’ll still be good. Enjoy! 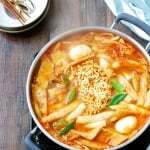 Would water need to be boiled as well or do you add the kimchi, kimchi juice, gochugaru, and the soup soy sauce and then boil everything together? No, you don’t need to pre-boil water. 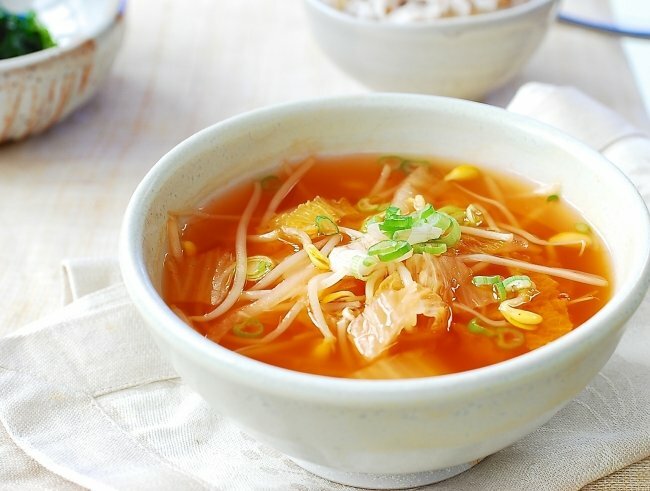 Is it okay to use sour bean sprouts or should they only be fresh? Use fresh soybean sprouts. Enjoy! HI. 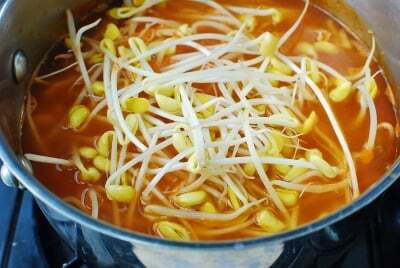 can ready-made soybean sprout soup be bought online? I haven’t seen it, but it’s very easy to make if you can find soybean sprouts in your area. Just so you know, the link in “Make anchovy stock with 8 cups of water. See the recipe.” is broken. Thanks for letting me know! It’s now fixed. I wanted to let you know; I cooked did this for my wife today, she has been suffering of congested sinuses last two days and within the hour her sinuses drained… It is a delicious easy to make meal, so much so , my coughing COPD mother in law passed by as I made it, and she tried it, she loves to try new foods, and we discovered for two hours after eating Kimchi Kongnamul Guk, she stopped coughing completely. So she took the extra portions I had home with her and asked me to gather ingredients and to teach her how to make it, for at her home as well. thank you . Oh wow that’s so great to hear! Thanks for letting me know. Can I save the leftovers?? If so, how long?? My mother used to make this all the time!!! Thank you for the recipe! !